1 How did the Asian tiger mosquito Get into the USA? 2 How do the Tropical Tiger Mosquitoes look like? Nowadays the mosquitoes with white and black stripes along the thorax (body) have invaded the USA. They are famous as the Asian tiger mosquito species. Scientists identify them as Stegomyia albopicta or simply Aedes albopictus. Their native habitat is the territories of Asian countries. Though, they have been spread to other tropical and subtropical regions worldwide due to shipping their eggs in cargoes. How did the Asian tiger mosquito Get into the USA? In fact, their eggs are so tiny and can withstand long dry periods. So, the Asian tiger mosquito eggs could be easily transported with cargoes worldwide. The Asian tiger mosquitoes first came to the south-eastern USA in the 1980s. The eggs hatched and the larvae found the new ambient conditions sufficient for living and development. Many eggs got to the tropical part of the U.S. in used car tyres that had accumulated some rainwater. California received some eggs laid in an ornamental plant “Lucky Bamboo” from south China. How do the Tropical Tiger Mosquitoes look like? The adult Asian tiger mosquitoes are average – sized. In fact, they are from 0.08 to 0.4 inches long, but only a few has a length of the upper end of that range. The male mosquitoes are 1/5 smaller than their mates. You can identify them by bright white and black stripes on their bodies. The Asian tiger females keep themselves parallel to the surface they are sitting on while blood-feeding. Most mosquito species bite at night between dusk and dawn. Though, the Asian tiger mosquito females fly out from the forests or shrubs in search of their hosts during the day. The peak feeding hours are in the early morning and late afternoon. As the other mosquito species, they detect carbon dioxide, typical chemicals and sweat that humans and vertebrates give off. The life cyce of the Asian tiger mosquito is closely associated with human habitat. Larvae breeds in different containers with standing water. Jars, tin cans, old tyres, watering cans, even excavations in plants make the ideal breeding ground for the asian tiger mosquito eggs to hatch. 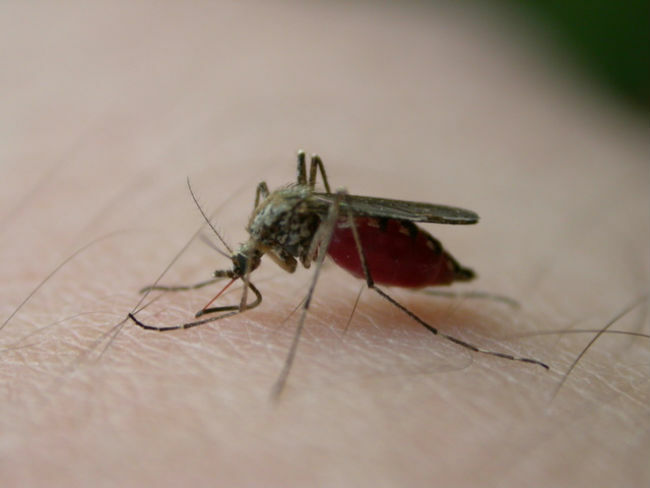 Adult mosquitoes prefer shady areas to have a rest and digest the blood. Thus, they hide in shrubs underneath, near the ground. In cold weather the asian tiger mosquitoes die, leaving their eggs near ponds or containers that accumulate water. The left eggs withstand freezing temperatures and hatch again in the spring, turning into imago mosquitoes in a week or two. In subtropical regions, such as Florida, California and southern Texas, the adult tiger mosquitoes lay eggs all the year round. The Asian Tiger mosquitoes bite not only people, but also birds and animals. Unfortunately, these fierce mosquitoes can be easily scared off while blood-sucking. So, they may pierce the skin of different animals and humans several times before they get enough meal for the production and laying the eggs. This feature makes them especially dangerous, as they can transmit viruses and diseases from one host to another. According to CDC (2001), the Asian tiger mosquito-borne illnesses are different fevers (Zika, dengue, yellow, Chikungunya), Eastern equine encephalomyelitis (EEE), Cache Valley, St. Louis and LaCrosse encephalitis viruses. These diseases are hazardous and even fatal to humans. The Asian Tiger mosquito is responsible for spreading heartworms in dogs and cats. Mosquito control methods aim at their extermination. Local authorities are responsible for elimination of mosquito breeding grounds. Thus, to prevent the Asian tiger mosquito population from growth, the exterminators perform insecticide treatment of areas near and over standing water via spraying and fumigating. Besides, homeowners spray essential oils and grow plants that repel mosquitoes from their backyard and make physical barriers. Moreover, to prevent bites, humans should apply repellent products on skin and wear long- sleeved clothing. To protect your home from asian tiger mosquito invasion, install screens on door frames and windows. Besides, do not forget using nettings.